This article was originally published in the May 2015 COPS Community Policing Dispatch e-Newsletter. The original article can be found here. School Resource Officers (SRO) have been criticized in some reports for being responsible for increases in arrests in schools. Associations have been made between the presence of school-based law enforcement and increased student arrests and referrals to juvenile court for school discipline issues—often for public order offenses, such as willful defiance, disorderly conduct, or disrupting the educational process. While there have been some instances of increased arrests in schools in the United States, other school-community partnerships are seeing opposite results—SROs helping to divert students from involvement with the justice system. disproportionately arresting students of color? making schools feel less safe?" Many communities find that SROs—one of the best known forms of school-based law enforcement—can help make schools safer. But if schools and law enforcement agencies do not make sure that SROs are well chosen and well trained, the presence of an officer in school can encourage a criminal justice response to misconduct better addressed by school administrators. How does a community do school-based law enforcement right? One of the goals of present-day school-based law enforcement should be to keep students out of the justice system. Involvement in the juvenile justice system can negatively impact a child’s life trajectory, hindering educational success, and raising the risk of adult criminal behavior. To that end, school/law enforcement/community partners can ask these four questions to help SROs maximize their potential to DIVERT students from involvement with the justice system. Has your school and law enforcement community defined the roles the SRO will play? Was there a thorough process to choose the SRO? Are the SROs well trained? Does the school have strong and clear policies related to supportive school discipline and diversion? The ways each of these roles is carried out have the potential to keep youth out of involvement with the juvenile justice system. For example, when SROs teach evidence-based programs like Gang Resistance Education and Training (GREAT), they are helping youth develop important life skills that can result in healthier decisions. Playing the counselor/mentor role is an obvious way that SROs can help recognize that students may be facing a range of challenging issues in their lives, such as substance abuse, witnessing trauma at home or in the neighborhood, or mental health issues. Last, how the SRO carries out the law enforcement problem-solver role is yet another way the officer can possibly divert students from involvement with the justice system. One of the most important ingredients of a successful SRO program is choosing the right officer. The bottom line is that someone who doesn’t like young people shouldn’t be chosen to be an SRO. How is the SRO chosen? Since the SRO works for the law enforcement agency, how does that agency decide who is right for the job? Are school personnel involved in that decision, because the officer will spend almost all of his or her time on the school campus? Also, is there involvement of the larger community? The interview process is central to choosing the right officer. Law enforcement agencies must assess the motivation and skills of the SRO candidate to work in an educational setting. 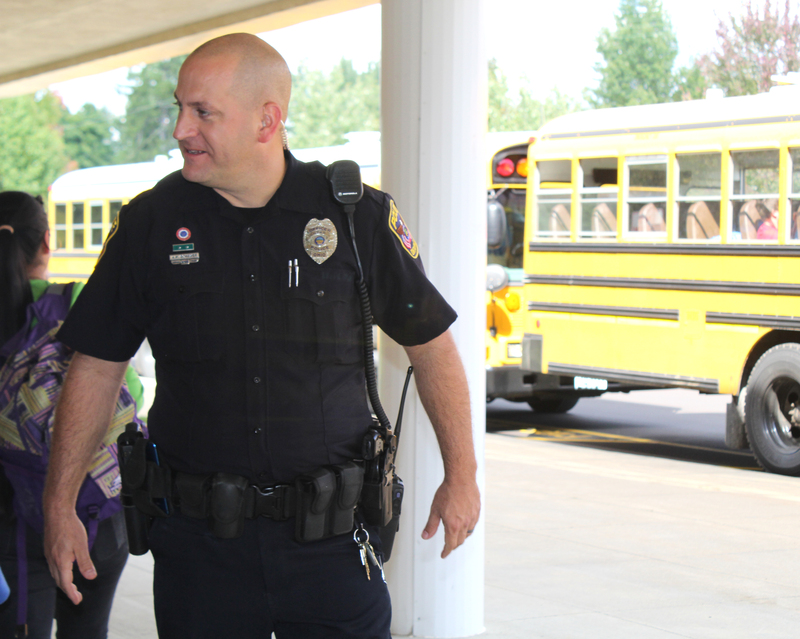 School administrators are also often part of the interview process, helping to determine if there is a good fit between the officer and the school. Even the broader community can have a role in choosing the SRO. Choosing the right officer means choosing someone with the right disposition for diversion. As one SRO in Utah put it during a recent training: “I don’t want to arrest a student unless I really have to. I want to get that student help.” Especially in light of recent events in the United States, it is important that SROs who are chosen have respect for youth and families of all cultures. Today’s SRO must receive ongoing training in many different areas, in addition to standard training that all sworn law enforcement officers must receive. SROs need to be trained in managing crises, including Incident Command System for Schools (part of the National Incident Management System). SROs should also receive supplemental training in juvenile law, adolescent development, positive school discipline, mental health crisis intervention, working with local cultural diversity, implicit bias, and de-escalation techniques. All of these specialized trainings can help the officers divert students from justice involvement. Policy is another powerful strategy that can be used to enhance the diversion role of SROs. Schools and law enforcement agencies can develop stated policies that help lessen involvement of youth in the justice system. Two policy areas should be clear: One is around school discipline; the other is on the diversion role of SROs. Employing language in policy that supports diversion is another measure. For example, the Intergovernmental Agreement between the Denver, Colorado, Public Schools and Police Department states: “SROs must de-escalate school-based incidents whenever possible. SROs must understand that Denver Public Schools have adopted a discipline policy that emphasizes the use of restorative approaches to address behaviors, and is designed to minimize the use of law enforcement intervention.” Policies promoting de-escalation and restorative practices support SROs diverting students from justice involvement. School-based law enforcement partnerships can employ these four roles to help divert students from involvement with the justice system—clarifying the roles of the SRO, choosing the right officer, training for diversion, and using policy. If law enforcement working in schools is going to divert students from involvement with the justice system, then the broader community needs to help by providing the alternatives to which students can be referred to hold them accountable and provide needed supports.